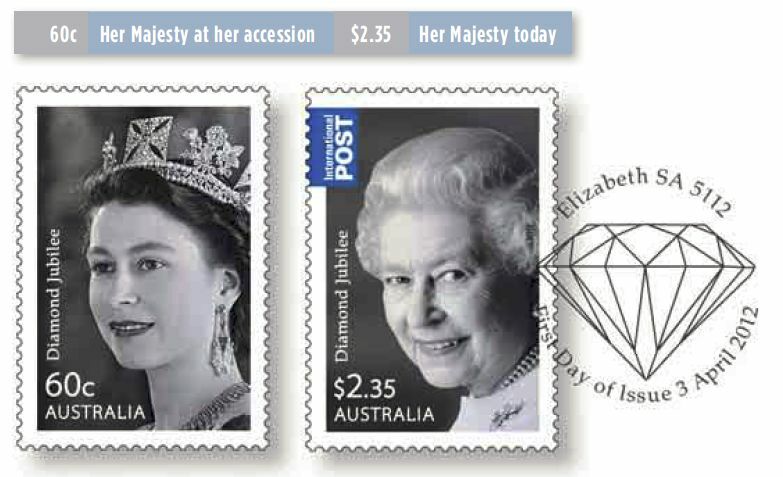 From 3rd April the Queen's Diamond Jubilee stamps will be available at Australia Post offices. Usually at this time of the year Queen's Birthday stamps are issued, but for this special occasion of the Monarch's Diamond Jubilee, the jubilee takes precedence of Queen Elizabeth's birthday, which is on 21st April, but will be celebrated in most Australian states on 11th June 2012. One of the major celebrations of 2012 is the Diamond Jubilee of the accession to the throne of Her Majesty Queen Elizabeth II and Australia Post has produced some very special products for collectors. The stamp issue presents a young monarch on the base rate stamp with the international stamp featuring the Queen as we know her today. Royal jubilees celebrate significant periods of a monarch’s reign. In 2012, Her Majesty Queen Elizabeth II celebrates her Diamond Jubilee, marking 60 years as Australia’s sovereign. She acceded to the throne on 6 February 1952, following the death of King George VI. Throughout her reign the Queen’s priorities have been loyalty and service to her people. The Diamond Jubilee provides Australia – along with Britain and other Commonwealth countries – the opportunity to celebrate her dedication to duty, and the grace and strength she has brought to her public life and role of monarch.